Australian games developer Greenheart Games has released a cracked version of its own product – a games business simulation called “Game Dev Tycoon” – as an experiment in education of pirates and their reaction to a game that tells them their software-pinching ways are evil. That cracked version was “uploaded … to the number one torrent sharing site” where friends of the developer seeded it. It's been in demand ever since. But Greenheart seeded the cracked version of the game with anti-piracy messages, such as that depicted on the screen below. 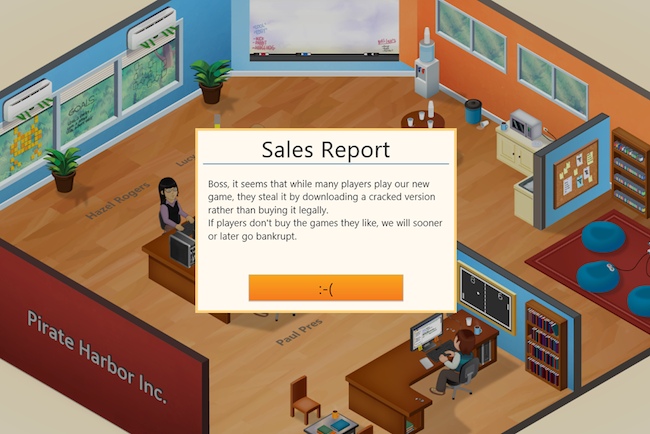 An anti-piracy message baked into the game "Game Dev Tycoon"
Once players see that screen it becomes nigh-on impossible to succeed in the games development caper, with profits proving elusive even as user numbers soar. Just as happens in the real world. Sadly, these entreaties have fallen on deaf ears: just 214 people have paid for the game, while over 3,000 are happily running the cracked version, even though the latter group can't be having much fun due to the effects of all that in-game piracy. Greenheart's Patrick Klug now feels releasing executable games is a bad idea. “Fact is that any game can be cracked, so all you do is spend time on something that in the end just annoys your real customers while only slightly delaying the inevitable,” he writes of DRM. “The only way to protect yourself is to create an online game. I guess that’s why so many studios focus on these types of games and it’s probably a driving force to eradicate traditional single player games.